Originally it began with little regular 8 mm cameras, then Super 8 mm, 16 mm and finally I owned a complete setups for 16 mm, sound, lighting and even the 35 mm camera package which was used on a number of James Bond films including Thunderball. I have raised and used hundreds of thousands of dollars to make films which were on topics of interest to me. To view individual pages on the films mentioned below, click on film poster. I have always gone back and forth between my photographic work and my film work. I really see very little difference except that, in my photography I like a very purist, direct approach while in filmmaking you manipulate everything to create a totally new reality. I’m always amazed at how that area in front of the camera can become its own reality. My work in one medium tends to enhance the other. My first films were little drawn or moving object animations. One planned film Continuum involved various brilliantly colored geometric shapes which were to change one into another which I worked on for more than a year, but never put on film. I would use stop motion to animate little battles of film reels in my darkroom. One Christmas I animated a fanciful world of clay. Another film I scripted but never filmed was to be a clay animated piece based on Penderecki's To the Victims of Hiroshima. I also experimented with a number of conceptual films of pure color, form and movement. One entitled Badge used Cream’s song of the same name to which I filmed cut glass at extremely close range with moving colored lights. I loved it and could have easily turned into a conceptual, abstract, non-narrative filmmaker. While in high school I made films instead of papers. One film equated chess with war. A much longer film which ran 17 minutes entitled Concern 70 had sections on pollution, over population, the Vietnam War, and just the general state of cultural flux of the late 1960s and a segment was shown on local TV. After I began teaching in Super 8 mm I made an 8 minute film entitled Kayak about a Colorado kayak race and its participants. 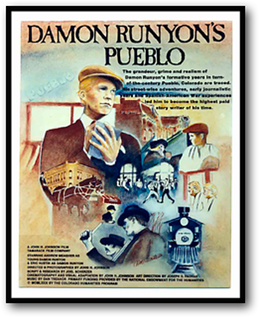 This film was used to help get the grant to do my first truly professional film Damon Runyon’s Pueblo. 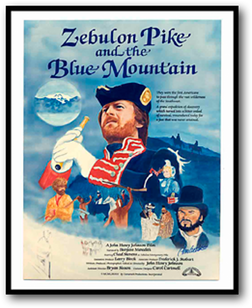 Then came Zebulon Pike and the Blue Mountain and finally, a strictly commercial project, Curse of the Blue Lights with the budgets on each level multiplying many times in amount. Over the years I have written (or contributed to the writing of) a number of as yet to be produced feature scripts including (working titles): in 1980 I wrote my first feature script The Awakening about the West’s environmental movement (not to be confused with the 2011 film by the same title), Red Wind, historically based murder mystery; children's fantasy Comic Book Hero; action, adventure western Jake and the Overland Stage and around 1990 when I was living in Burbank, California I wrote La La Land about an independent filmmaker's adventures in Hollywood (again not to be confused with the 2016 musical by the same name, you can’t copyright titles unfortunately). Also, I have developed and researched a number of other historical documentary projects. 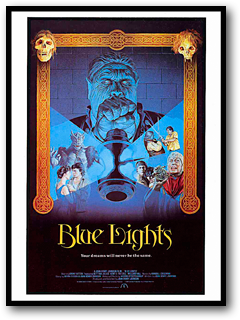 Eventually, after Blue Lights success, we moved to Burbank, California for four years. But while I was there, the roller coaster which is filmmaking allowed me many unique experiences: to see Steven Spielberg and tour his compound (his personal assistant’s brother in Oklahoma had read an article I’d written for American Cinematographer magazine on the making of Runyon), worked in what was said to be the world’s largest photo lab, Colorhouse, in Burbank (film backgrounds were printed in 6’ wide strips), met James Cameron, Gale Anne Hurd, Richard Edlund, and Alan Daviau among others. While at Colorhouse I did photographic work for all the studios, networks, NASA, Revelon, etc. Two of the most interesting jobs I did were for Johnny Carson and Bob Hope. Carson’s son (a landscape photographer) had tragically died when his four wheel drive tumbled off a cliff into the Pacific. I custom printed a number of his family snap shots of his son with their family and Carson personally came by the lab to thank us. Hope’s wife had me print a simple black & white image of him and their two white dogs in their backyard for his birthday present. After moving to California I read an editorial in Variety by an old sage of the film business about the importance of independent filmmakers to Hollywood. The words could have been mine. I met the author who was producer/lawyer Max Youngstein and we became a good friends. Max was one of the “second five” United Artists moguls who (along with Arthur Krim, Robert Benjamin, Arnold Picker and Bill Heineman) bought out the original five actual “united artists” (D. W. Griffith, Charles Chaplin, Mary Pickford, Douglas Fairbanks, and lawyer William Gibbs McAdoo) and who had mentored such directors as “Stanley” (Kubrick) and “Woody” Allen and others. He was instrumental in many significant filmmaker's careers. Max was something of an institution in Hollywood. On his office walls were pictures of himself and various notables, one showed him, Chaplin and the Queen of England! He was full of wonderful stories. He liked my films, particularly the 360 degree tracking shot I did of Chad Stevens who played Pike in Zebulon Pike and the Blue Mountain which showed the explorer and the terrain moving behind him which made him famous. Max once told me "you have a terribly great talent for making movies and if we keep trying we"ll prove it to the world". It was his belief in me that kept me in California for four years. We tried for a number of years to find something we both wanted to do, but finally, my family and I decided that Colorado was where we’d rather be. Max and I never did find anything we both wanted to do or could fund. Max died shortly after our return to Colorado and my return to teaching. Filmmaking is very interesting, but you have to rely on too many others and it is so prohibitively expensive to pursue with the projects taking a great deal of time. But I would like, at some point in the future, to make some of my “as yet unfilmed” projects. To contact me regarding my film work, a particular film or public presentations of my films email me at: tamarackprod@mac.com.